If you are not on Instagram you probably are not aware of the flurry of mini quilt swaps that have been happening over the last year or so. Hundreds and hundreds of mini quilts have been made a swapped all over the world and people’s homes now have walls adorned in beautiful little quilts. After resisting for nearly a year, in February I finally signed up for my first mini quilt swap – the Cotton and Steel mini quilt swap. 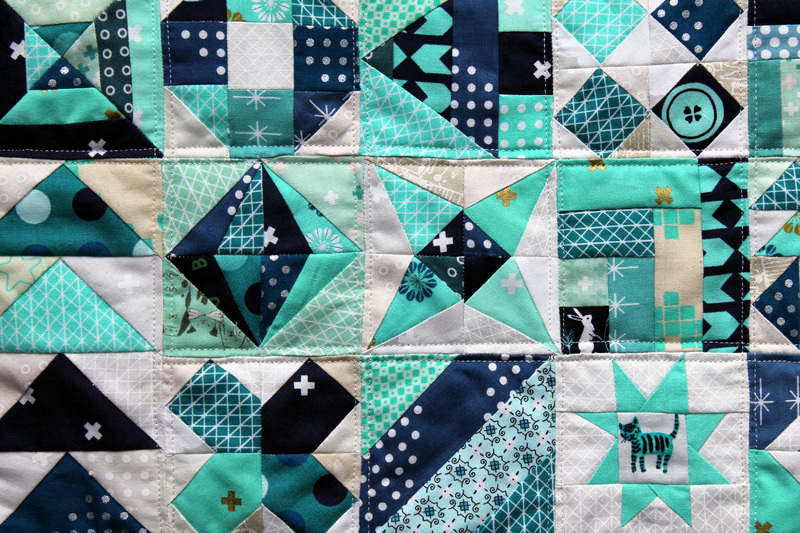 I shared my first quilt for this swap a couple of months ago, including the paper piecing pattern I used for this quilt on my original post……. I loved making this 15 inch square sampler and shrinking all these quilt blocks down to 3 inches was fun. Nearly all these blocks were paper pieced as I find it is the easiest way for me to get accuracy at this small size. 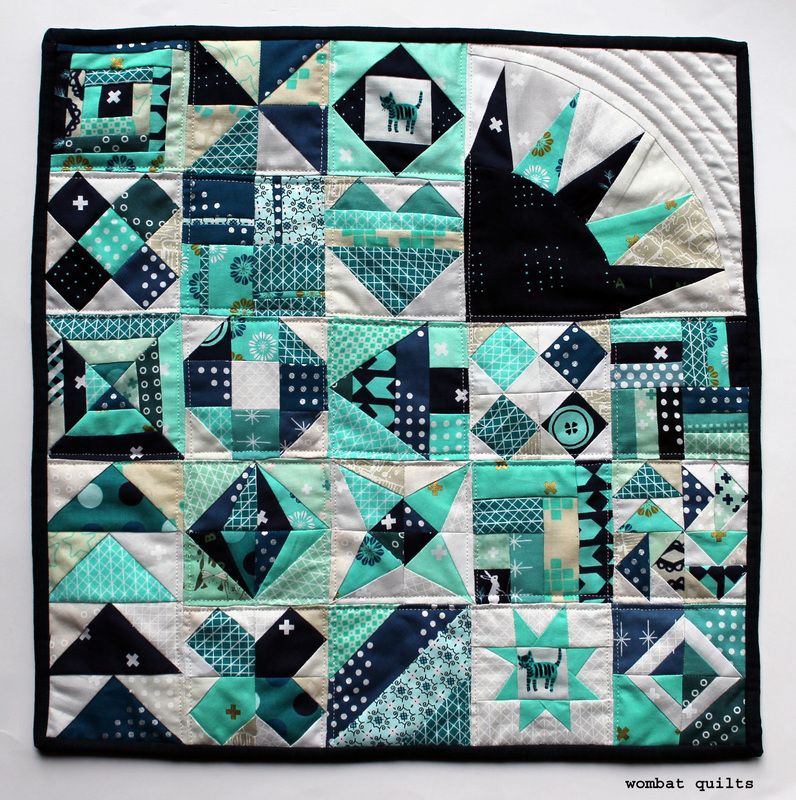 I really loved putting this quilt together…and even found some prints I could fussy cut at this small size! So with my Cotton and Steel mini done I felt the need to sign up for another mini swap… this time the Lizzy House mini quilt swap. Now Lizzy House is my favorite designer… I love her prints. As so many of my quilts end up going to kids charities Lizzy Houses fun, modern novelty prints were an instant hit with me. So this is my Lizzy House mini work in progress. The day I signed up for the swap I started making hexagons and once I had them all I had a blast arranging and re-arranging them until I had a layout I was happy with. ..which is much more her style. 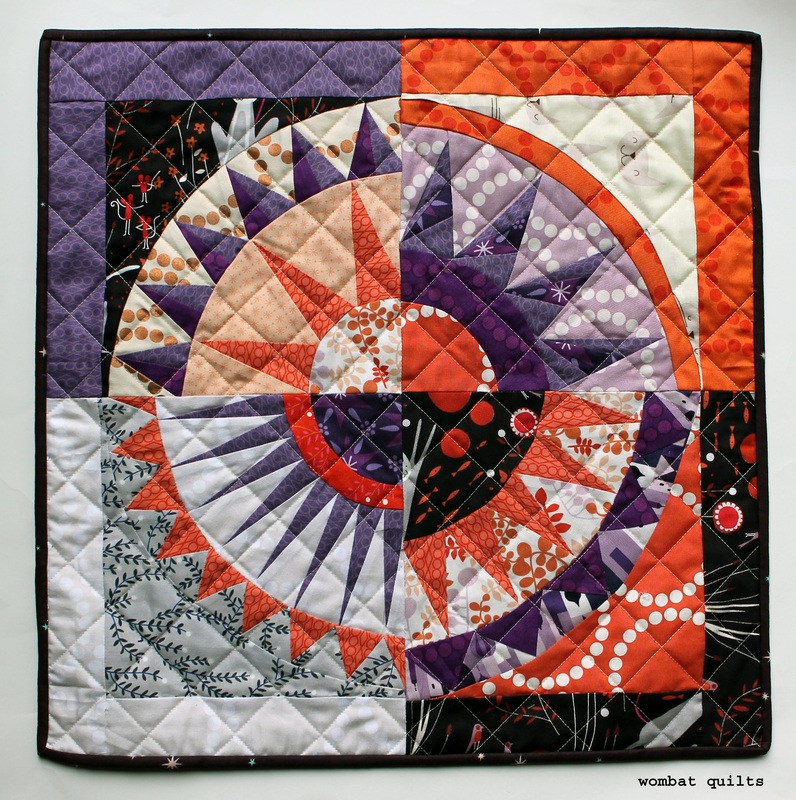 This quilt is uses four different New York beauty patterns… and I love the unity of the similar shapes of the New York Beauty block combined with the disconnect of the different patterns pieces. I am sure my partner will love which ever mini I end up sending. I have a couple more weeks before the quilts have to be sent and there is a chance I will change my mind again and make something else. This is the joy of mini quilts…they are so quick and easy to make. So I can now say I am a mini quilt addict, though I have controlled myself this month and not signed up for any more swaps…yet. « The last green star…. Oh, I love them all, and I’m unhappy that I’m not your partner. 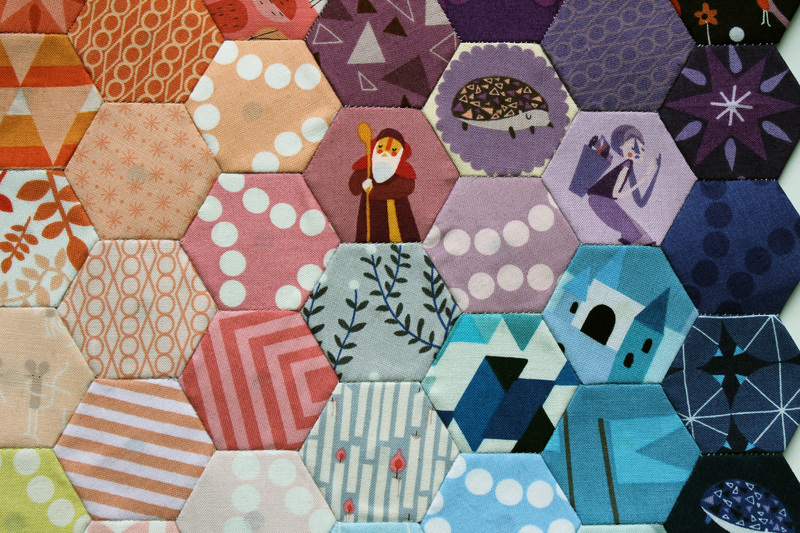 The hexagon quilt is my favorite, of course. I love the colors in the sampler-style mini. The EPP hexes are great too. My favorite hexes are the fussy cut people. What a luck, that I don’t have an Instagram account. *gggg* The minis are sooooo amazing – especially the hexies – really lovely! Seriously, beautiful work; they are all fun, happy, quilts, and we are all jealous of your partner. Oh they’re all lovely! Are they all about 15″ x 15″? Lynne the New York Beauty is 18 inches square and I am not sure how big the hexies will finish up. I do like my minis to be on the smaller side. What was the timescale for making all these quilts? The sheer quantity is mind-blowing, never mind the superb quality. Viv the turn around is usually 3 months which is a lot of time. These small quilts can be turned around really quickly if needed and they are a great way to test out piecing and quilt in ideas. 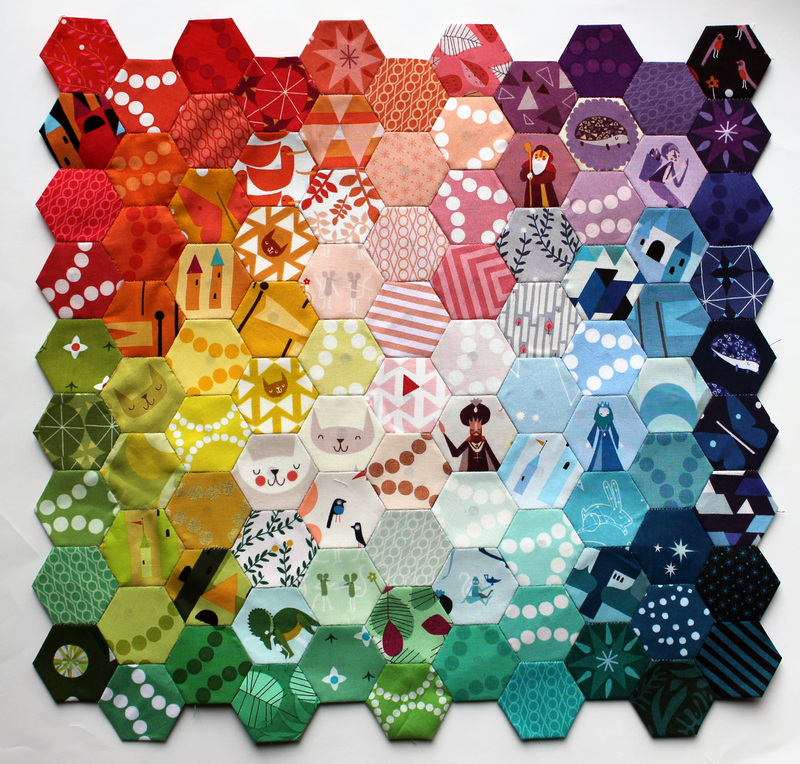 I am a huge lizzy house fan and I have been drooling over your hexagon quilt some I first saw it. I love love love it and hope to have something like it hanging in my sewing room someday too! 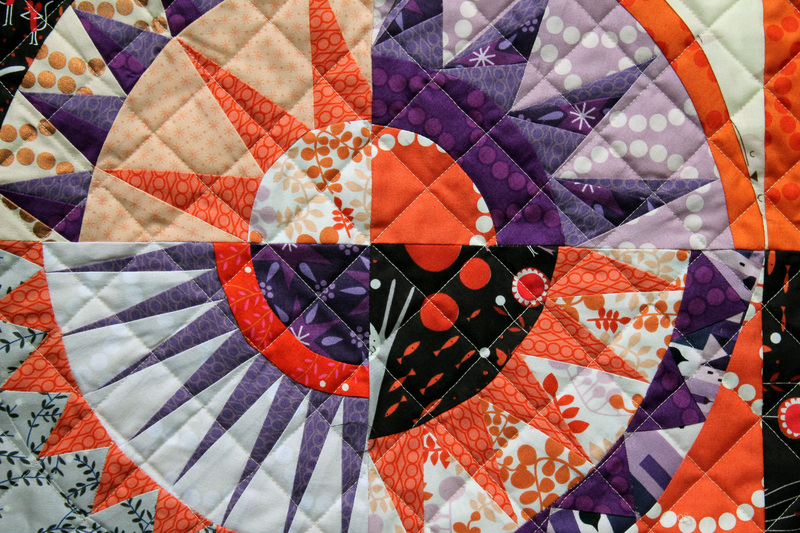 I am a huge lizzy house fan and I have been drooling over your hexagon quilt for quite some time now. I love love love it and hope to have something like it hanging in my sewing room someday! You are so clever! I love all of these – such a visual feast! I regret not signing up for the Lizzy House swap now. I love her fabrics but was suffering from a bit of swap fatigue at the time. Oh well perhaps I can do myself a selfish swap? 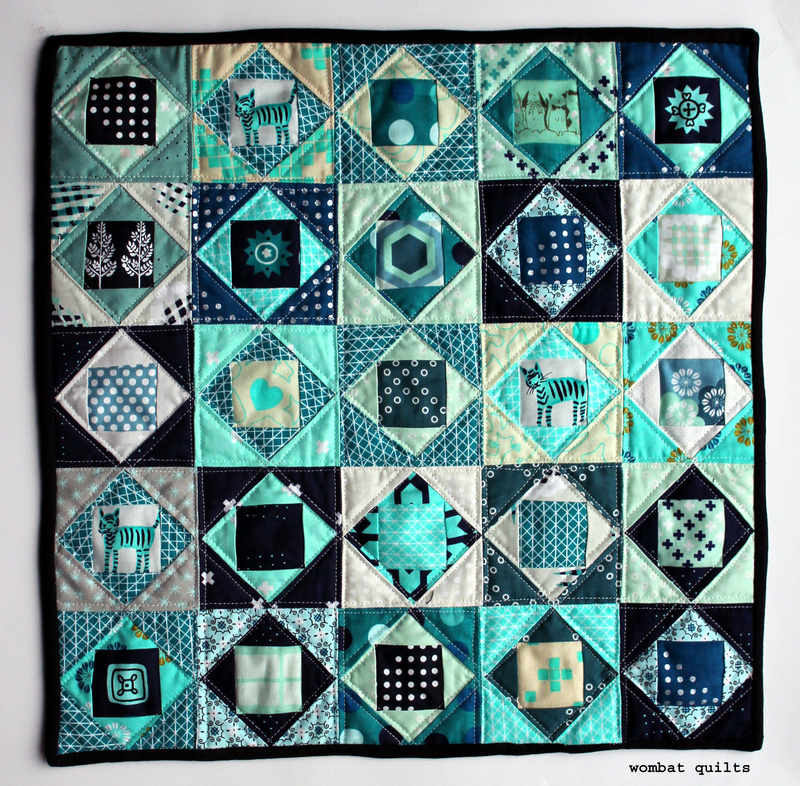 I love the idea of a sampler style quilt. I saw your Lizzy House hexies on IG and instantly fell in love with them! I’m going to ahve a fair bit of Lizzy left over from the swap, so I might take your lead and make one for my new sewing room … eventually. love your colour choice on all! great job! Beth let me know if you would like a Lizzy House hexagon starter kit. I am happy to send you some fussy cut 2 1/2 inch squares and some hexie papers to get you going. That is so kind of you!! I have several projects going now including a quilt that needs a lot of embroidery on it, so It’s going to be awhile before I can get started on something new. (I took Rachel’s [Stitched in Color] hand sewing class [wonderful!] and a neurological condition I have has put me way behind, but I’m determined to finish my quilt and my lessons! 😀) I truly love your minis and they have lit a fire under me, but I would want to show you some progress before two years if I were to accept your kind offer! However, if I do succumb to the temptation and get to working on a Lizzy House mini, I will be sure to share my attempts with you. I love the quilting community because of people like you, so generous – hearted and talented. Your offer means a lot to me. Thank you! Beth the offer stands….when you are ready I can send you a little packet through to get started. Just let me know. I love your minis!!! I agree-the swaps are so tempting! I’ve only been able to resist signing up for all of them because of the baby I’m about to birth! 🙂 I still have done two, though, and wouldn’t be surprised if I sign up for another one (or two) after I get back into the swing of things post-baby. Minis are so fun since you can try out different methods and still have a fairly fast turn around! Can I say I love them all and who ever gets them…they are so very lucky and of couse, will love them too! I have yet to sign up for a swap, but have wanted to for so long. Maybe next time I see one I’ll jump on the band wagon too! I have just started on the hexi addiction …. I have to say that your New York Beauty mini is my absolute favourite though. What a stunner. I have several Mini Quilts on my To-Do list. Maybe I should get started on one! I am just loving your paper piecing ideas and thank you for generously sharing the patterns. Pam I downloaded the Pink Snowball patterns as PDF files as I just had to make them, but I finished the first one yesterday and it went together just perfectly. If it’s going to be joined to the squares which are 6-1/2″ shouldn’t I have ended up with a 12-1/2″ size snowball which once it is sewn into the quilt it would be a 12″ finished size. Can you let me know if the snowball blocks should be 12-1/2 ” unfinished or what you think ??? I know you’re busy but I’m a bit stumped over what I’ve done wrong. Thanks heaps Pam and thanks again for a lovely site. I have double checked the pattern the measurements are all correct… so I have two ideas about what went wrong. The first is did you download to your desktop or print from from the your browers. Adobe has a fun little quirk where if you do not download the pattern to your desktop and print from the download it does not print to scale (it prints a little smaller than scale). My other idea was that the “scale to print” box was ticked when you printed the pattern. I always make sure that I measure the pattern once I have printed it to make sure that it has printed to size, especially if the pattern has to be exactly 12 inches. If neither of these things are the issue I am stumped. If you printed the pattern correctly, made the blocks, trimmed your blocks with the correct 1/4 inch seam allowance all should be good. Have your ripped off the paper from the block yet? If not can you measure the pattern for me and tell me what you have. I tend to turn what others would make into mini quilts into cushions. 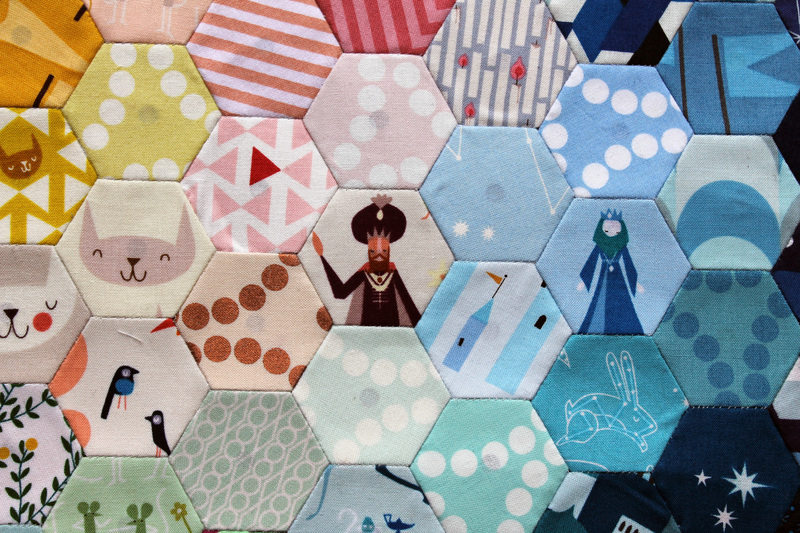 The Lizzy House hexies would be a great cushion! Recently, I have seen friends’ sewing room walls adorned with minis. I might too have to make one and resist turning it into a humidicrib cover or a cushion. I really didn’t appreciate Lizzy House until I saw pictures like yours from this swap popping up about the place. I get it now. So cute. Love at first sight!! Must learn to paper piece, your New York Beauty is irresistible.